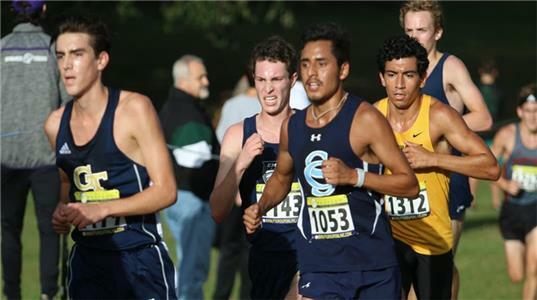 The Cleveland State Community College Cross Country team competed in the Berry Invitational on Saturday. It was a nice cool morning for the Cougar's biggest race of the year. The field was stacked with D-1 competition such as Georgia, Berea, and UTC. A total of 20 schools attended most of them were D1, D2 schools. Luis Perez led the Cougars running a personal best 8K time of 27:30. He finished a solid 58th overall out of 212 runners. Derek Gallardo had a phenomenal showing as he also ran a personal best time of 29:34. “I am very proud of Derek. He has been sick and injured most of the season, but I think he showed today that when he gets back to full health he will shave minutes off his time. Derek is a hard worker and I look forward to see what he can do next year as he will be expected to take over the number one spot, “ said head coach David Kyle. Alberto Dominguez also ran well as he ran a personal best with a time of 30:35. Alec Bloomer powered through an illness and ran a 31:12 while David Tullock, who's still nursing a knee injury, finished with a time of 33:23. The men's team finished 15th out of 20 teams. The women's team ran a 6K race at the invitational, placing 21st out of 24 teams. Madison Guider ran yet another solid race finishing 62nd overall out of 217 runners. She was just off her personal best time of 25:10 from a few weeks ago, running a 25:29 this round. KiAna Queener, who's still battling knee issues, ran a solid race with a time of 28:41. "I expect KiAna to continue to improve as we get her knee issue straightened out,” commented head coach David Kyle. Whitney McConnell also ran a great race, delivering a personal best time of 28:59. Alexis Kyle ran well as she ran a 30:56, only 13 seconds off of her best time this year. Sadie Lane, fresh out of a boot, gutted it out and ran to a 35:51 time, only six seconds off her previous performance. "This team has battled sickness and injuries all year but they keep trying their best every time. I am super proud of this group. I can't wait to see what we can accomplish with a fully healthy team. They are a group of fighters and they won’t quit," commented head coach David Kyle. Next up for Cleveland State is the Signal Mountain Road Race taking place on Saturday, October 20th.